Laminar flame speed is the propagation speed of the flame cone under laminar conditions at which the oxidation takes place and is the key factor for determining the suitability of gas. The speed at which an oxidation reaction takes place between the combustible constituents of a gas and oxygen at the surface of the inner core of the flame is called the laminar flame speed. It is dependent on the air-fuel ratio, Lambda, and attains its maximum shortly before Lambda = 1. Lambda = 1 is the condition where there is an ‘ideal’ air/fuel ratio l known as stoichiometric. Lambda below 1 is a ‘rich’ mixture and Lambda greater than 1 is a ‘lean’ mixture. Laminar flame speed is the decisive criterion for low concentrated gases as to whether it is possible for the air-gas mixture to be completely burned in the engine. The laminar flame speed of the gas must attain a minimal value of about 8cm/s at Lambda = 1 to ensure engine operation without a supporting gas to aid the combustion process. 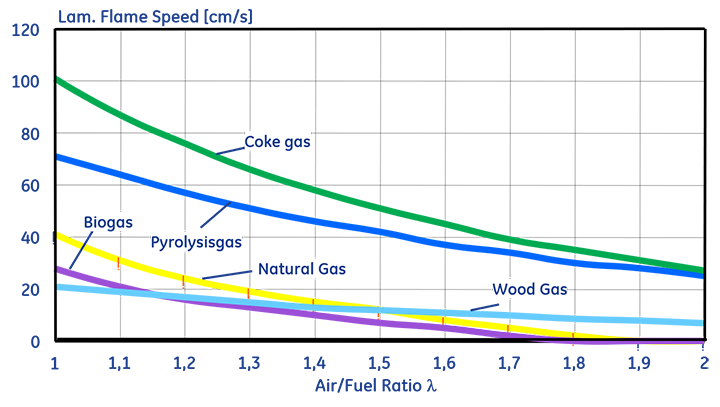 Fuel gases have different properties which can be assessed through their characteristic values such as laminar flame speed and also methane number and heating value. To be able to achieve the ideal degree of energy conversion, these values must be considered when dealing with the engine and when assessing the suitability of the gas to be used.